Registration is now open for the 69th Australasian Grain Science Conference. AGSA offers full registration, day registration and student registration options. Full conference registrations include a ticket to the Welcome Reception and the AGSA Conference Dinner. Student conference registrations include a ticket to the Welcome Reception and the AGSA Conference Dinner. Additional Welcome Reception and the AGSA Conference Dinner tickets can be purchased for day registrants, student registrants, guests and accompanying partners. Full conference registration and student conference registration includes annual AGSA membership. Conference day registrants can purchase annual AGSA membership for an additional fee. Includes access to all Conference sessions, daytime catering Tuesday 27th – Thursday 29th August, the Welcome Reception / Poster Session on Tuesday 27th August and the Conference Dinner on Wednesday 28th August. Includes access to Conference sessions and daytime catering for nominated day(s) only. Entry to the Welcome Reception / Poster Session and Conference Dinner ARE NOT included. Tickets can be purchased on the registration form. Accompanying persons are not permitted access to Conference sessions. Tickets to social functions may be purchased for accompanying persons – see registration form. All cancellations must be notified in writing. Where notice of cancellation is received before 31st July 2019, registration fees will be returned less an administration charge of $160. No refunds are available for any cancellations received after 31st July 2019, however you may nominate a replacement delegate. A fee of $65 will apply for transfer of registration to another delegate after 31st July 2019 (no fee for registration transfers prior to this date). The Dress Code for all conference sessions and social functions is Smart Casual. Delegates are responsible for arranging their own accommodation. Special rates are available at the conference venue. Details are available on the Accommodation section of the website. Updated information on the scientific program will be posted on the website. AGSA offers a range of awards. For details, please refer to the website. 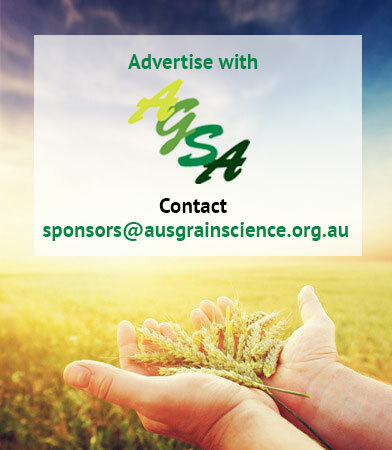 By registering for this Conference, you acknowledge that the Australasian Grain Science Association will use your contact details for the purposes of administering this and future conferences. Your contact details will be included in the list of delegates for conference attendees unless you elect to have your information omitted from the list (see registration form). Delegates, accompanying persons and guests are advised to effect their own insurance to cover all risks including (but not limited to) costs of travel, accommodation, conference registration, injury/death, health and medical expenses, personal property and all other risks. The Conference, host organisations and organisers will not be held liable for any claims under any circumstances.